I just moved from San Francisco's Bay Area to Washington DC -- my seventh move in six years. To me, "home" has become a very relative concept. In fact, I don't remember the last time I used "home" to describe where I live. I usually say "my place" or "my apartment." Last fall I got a package from Nassim Mir. She had taken photos of homes in Florida, mostly from the front, showing not much more than an entrance door or gate. I didn't know what to do with them. They weren't about Iran or Iranians, so I shelved them. As I was packing to move to Washington DC, I came across Mir's photos again. And they made a lot more sense: large, new, beautiful buildings that inspire little other than comfort. In Iran, many of us had only modest homes. But our home was where we grew up. It was where we played with friends. And our home was in our neighborhood, in our town, in our country. 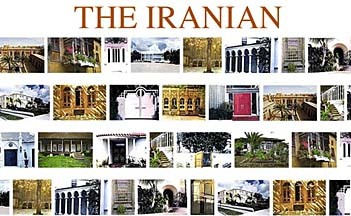 Then I saw "Iranian House" (Ministry of Housing and Development, 1996), a book with hundreds of photos of old homes in various parts of Iran by Jassem Ghazban-pour. I hadn't been homesick for a long time. But looking at this book while getting ready to move to a new city in America, made me want to be back home. But to me, home will always be 110 Braim, in Abadan. I cannot go back there -- I don't even know if it survived the war with Iraq. I'm in my new "home" now -- in an apartment complex on 16th Street in Washington DC. And I, as so many of us in the U.S. or other parts of the world, have to make the best of it.